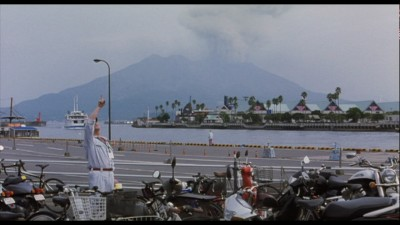 A drawing of a volcano erupting turns into an animated graphic, and as lava and smoke pour from the mountain peak, it gives way to a cinematic eruption, a montage of images from the preceding 90 minutes or so of Hirokazu Kore-eda's 2011 film I Wish. It's a short, fanciful sequence, but crucial. It illustrates just how much is really happening in the film, and also drives home for the boy from whose imagination this explosion has sprung how far-reaching life really is. The boy in question is Koichi, played by the excellent child actor Koki Maeda. Koichi lives with his mother and grandparents, while his father and goofy younger brother, Ryu (Ohshiro Maeda), have moved to another small town, far enough away that the siblings now only communicate via cell phone, they never see one another. Koichi's fondest desire is to have his family back together, for all four of them to live under one roof. His brother is not as optimistic. Ryu remembers how bad their parents fought, and he'd rather they keep the peace by staying out of each other's way. The director is clearly playing on the real-life rapport and differences of the siblings, while also offering an incredible insight by making the less serious of the pair (Ohshiro is adorable and completely lacking in self-consciousness onscreen) the only one of the two who really takes the matter seriously. The most heartbreaking scene in Kore-eda's film is not when Ryu confesses to his elder sibling that they don't share the same fantasy of familial bliss, or the flashback when we see the marital strife and how it affects the children differently, but when their mother (Nene Ohtsuka) calls Ryu to ask him why he won't come visit. He tells her it is because she always says he's just like his dad, and given all the problems between them, he can only assume she doesn't like him as a result. Many children of divorce will feel a real pang of regret hearing this, as a good number of us heard or believed some variation of the same. There are other similarly raw moments throughout I Wish, but they come wrapped in small bundles, stealthily smuggled in a narrative about childhood longing and the kind of daydreaming that never dissipates, regardless of age. Koichi has drawn his picture of a volcano in hopes that the very real volcano that flanks his hometown will give off a blast strong enough to make the locale uninhabitable, forcing his mother to move back in with his father. In hopes of making this happen (and, for the most part, in denial about the death toll such a disaster might cause), Koichi clings to an urban legend about a bullet train interchange where observers can shout out their wishes in hopes of them being granted. To make this happen, he concocts a scheme for himself and his school friends to meet Ryu and his schoolmates--humorously, they are all girls--at the midpoint where the bullet trains going in opposite directions are supposed to pass. Most of the other children shout out for very typical childhood dreams, like becoming a famous athlete or celebrity. One wants to challenge death by requesting his beloved pet be returned to life. These desires may be equally selfish, but they are contained. Koichi, on the other hand, will disrupt everyone's lives, many of which are being lived with vigor. Wanting something better for oneself is the unifying thematic element of I Wish. Kore-eda strings a chain of longing between all of his characters. The kids regularly sit around and play "what if" games, imagining their future selves as the manifestation of their wildest dreams. These may be naïve fantasies, but on the flip side, the adults in their lives have suffered the disappointment of such fantasizing and, for the most part, have not abandoned their yearning to still have more. The boys' dad is a musician who never stopped pursuing his art, while their grandfather is ready to disregard his retirement and return to baking, making a special rice cake with bean curd--albeit a dessert that requires a certain sophistication to enjoy (Koichi grows into the taste over the course of the movie). Even their mom continues to imagine having a better life. What I Wish demonstrates is that we never stop wishing. Life is continual striving. Comparisons between Kore-Eda and Yasujiro Ozu, the master of Japanese family dramas, are both common and inescapable. Though fairly convincing arguments can be made why they aren't an exact match, I still think there is an apt similarity between the two filmmakers. The director of Still Walking and Nobody Knows is not that far removed from the director of An Autumn Afternoon and Good Morning. The latter film, in particular, has much in common with the contemporary filmmaker's portrayal of children in Japan. The only thing that really separates them is time and the conventions of their era. Ozu was all about control, meticulously creating each film to match a vision of Japanese life that was nostalgic even in his post-War heyday. His films often explored the divide between the young and the old--a theme that is essential to I Wish. Both directors traverse the separation in a manner that shows how small the gap really is. If Kore-Eda's approach is less rigorous, it's only because of loosened social mores and expectations. It's reflective of the differences of being a kid now and being one 60 years ago when Ozu was at his height. Hirokazu Kore-eda actually strikes an elegant balance (and reconciliation) of the lazy days of pre-teen life and the emptiness of misspent adulthood. Though I Wish has some magic to it, particularly in how coincidence and repetition are important factors in how the story unfolds, its rhythms are more realistic. The seemingly endless day-to-day routine of elementary school informs everything Koichi and his companions do. What does, for instance, one day not going to class really mean when there are hundreds of more days just like it laying out in front of you? I Wish finds the central point between believing childhood will never end and wanting to make sure to take advantage of what is essentially a finite existence. Grown-up responsibility will be here soon enough! Childhood is both anarchic and confined. So is I Wish. It takes plenty an unscheduled detour with its young stars, but everything always funnels back to the structured whole. I Wish is released by Magnolia as a widescreen, 1.85:1 anamorphic transfer. Colors are vibrant, resolution is strong, and this is a fairly good example of how standard definition is not that far removed from high definition when the source material is both strong and properly employed. I saw no instances of enhancement or pixilation; just a good looking disc front to back. The 5.1 Dolby Digital mix on the original Japanese soundtrack does a really great job of preserving the director's documentary-esque approach to filming. Dialogue sounds natural, and there is good attention paid to ambient sounds to create a realistic soundscape that mimics the way we hear real life. The English subtitle translation is really good, conveying the character of the original dialogue without leaving non-Japanese viewers behind. There are also Spanish subs available. Highly Recommended. I Wish is an enthralling childhood narrative, illustrating the reality of the lives of young Japanese students as they navigate the dreams of youth on their way to the expectations of adulthood. Acclaimed filmmaker Hirokazu Kore-eda has created an agile narrative that ping-pongs between the inherent drama of everyday survival and the breezy realms of the young and hopeful, drawing a line between both to also show how the same things affect the children's parents and grandparents. Performed with an honest flair and emphasizing character and personality in every shot, I Wish is a smart, funny validation of man's capacity and drive to stay alive and keep living--which, when you think about it, are two entirely different things.